Grey Ruegamer described himself as a “tall, skinny fat kid” his freshman year at Arizona State University. At 6-foot-4, the center weighed 245 pounds. But by the end of his senior season, the scale read close to 290. It’s an adage as old as football: The game is won or lost in the trenches. Even in the modern age of spread offenses and skyrocketing passing numbers, the ability to push an opponent off the ball will always be a benefit. The expectation of winning in the trenches, however, can cause players to live relatively unhealthy lifestyles, ballooning to sizes far above their body’s natural weight. It presents a challenge for many after football, too. Some follow strict diet and fitness plans to reach a healthy weight. 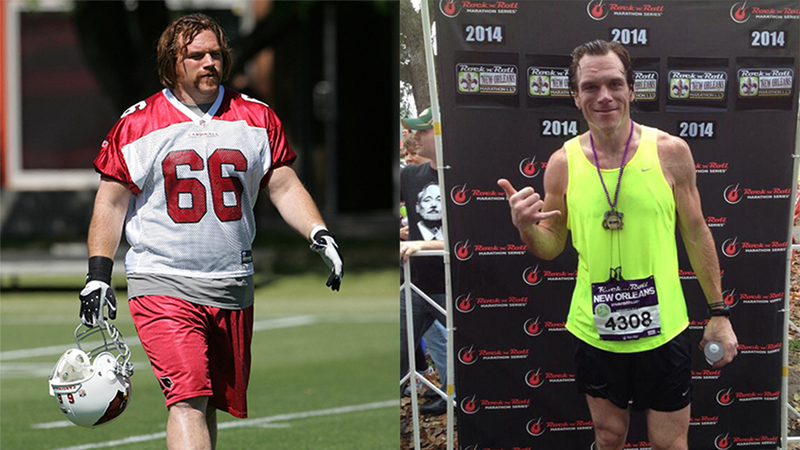 Former Arizona Cardinals guard Alan Faneca, who weighed as much as 320 pounds when he played, ran a marathon less than three years after retirement. But others battle lifelong health issues, including longtime Chicago Bears defensive lineman William Perry, who weighs more than 400 pounds, is battling diabetes and is confined to a wheelchair. NFL players, linemen in particular, have gotten considerably larger over the decades. Generating force comes in two parts: acceleration and mass (essentially weight). An increase in weight allows the player to produce more force. The Washington Redskins’ fabled “Hogs” offensive line from 1982 weighed an average of 280.2 pounds. Last season, the average Washington lineman weighed 321.4 pounds. It’s a trend that’s held true across the league for the past four decades. Peters maxed out at 325 pounds during his playing days. Today, he hovers around 270 pounds. Ruegamer now weighs about 275. It’s easy to look at a weight of 270 pounds and think, “These players haven’t really lost many pounds.” But many forget, these are massive, big-boned humans. The 50th percentile (average) height and weight of an offensive tackle is 6-foot-5, 314 pounds, according to data from The Scouting Academy. The average height for an American male, according to the Centers for Disease Control, is 5-foot-9. The average weight is 195.5 pounds. Pollak maxed at 310 pounds when playing, and he, too, is about 270 now. Some players quickly cut significant pounds after retiring. Faneca, a 13-year offensive lineman in the NFL, made headlines in 2014 by running his first marathon. Faneca dropped 70 pounds in his first three months after retirement and weighed 210 when he ran the marathon. Faneca, who played collegiately at Louisiana State, might be the rare player making headlines for shedding pounds, but he’s far from the only former player bent on trying. A 1994 study by the Centers for Disease Control and Prevention found that former NFL offensive and defensive linemen experience a 52 percent increased risk of dying from heart conditions compared with the general public. But extreme weight poses health threats beyond the cardiovascular system. Geier, with the American Orthopaedic Society for Sports Medicine, noted the risks to hips, knees and ankles. This often leads to arthritis symptoms, often emerging mid-career. For a lot of players, maintaining that much weight is significant challenge. The NFL life is taxing on your body. Morning workouts in the sun, followed by intense weight training, burns well more than 1,000 calories a day during the season. To gain weight, players have to eat more than they’re burning and metabolizing. “It’s not easy. 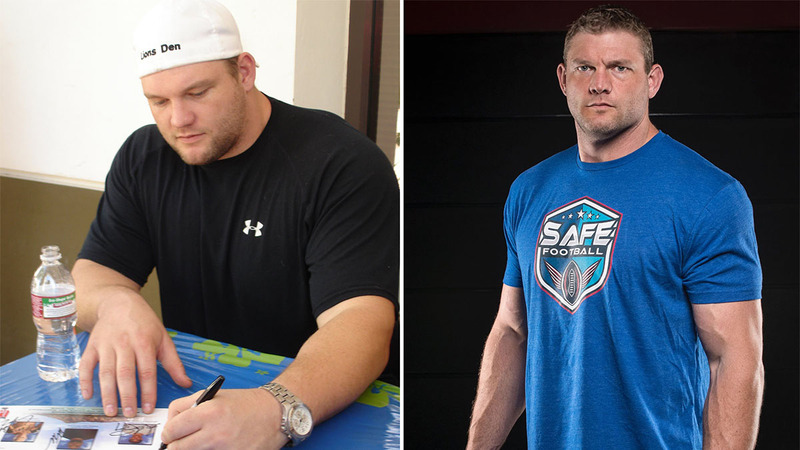 Because of the workload and stuff, it’s not easy to gain weight,” Westerman said. There are many stories about team dinners where players order multiple steaks or rookies get stuck with expensive bills – largely due to alcohol – but NFL players eat like this regularly, just to maintain their playing weight. “As you’re playing, you’re eating a tremendous amount of food,” Peters said. “I can’t even imagine. I’d be a blimp today if I ate even close to what I ate when I played. Many teams hold regular, player-organized dinners for their offensive lines, with the bill going to each member on a rotating basis. Peters says these dinners include numerous appetizers for the table, and players order multiple entrees for themselves. The National Football League isn’t all glitz and glamor. Players live under rigorous daily routines, arriving at team facilities early in the morning for team meetings, film study, positional and team practice and drills, weight training, news-media obligations and therapeutic recovery or treatment of injuries. Finding a replacement to the arduous NFL routine can be tough after retirement. Having a plan to adjust to post-career life appears to be crucial to success for many players. Peters opened a mixed martial arts gym and got involved in jiu jitsu and boxing. Pollak’s younger sister is a registered dietician who has worked with football players before. She helped him develop a strategy. When Westerman retires, he wants to get to 240 or 250 pounds and be “slimmer and more cut up” through bodybuilding or martial arts. Pollak said most guys who don’t lose a significant amount of weight in the first year never will. Like Pollak, many former players still talk among one other about this issue, and they talk to current players about post-football life. For them, it’s more of a means of accountability, not a way of measuring themselves against their peers. No longer are they in the league with external pressures to remain healthy; they have to rely on each other to be ready when the time comes to walk away. “The game will take something away from you,” Ruegamer said. “It always will. It’s not like you can expect to walk into football and expect to be 100-percent purely healthy coming out the other end, that’s just not what it is.